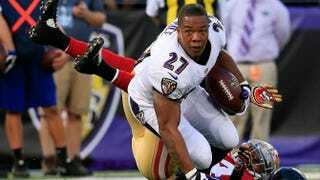 Running back Ray Rice of the Baltimore Ravens loses his helmet after being tackled by strong safety Antoine Bethea of the San Francisco 49ers during the first half of an NFL preseason game at M&T Bank Stadium Aug. 7, 2014, in Baltimore. The Baltimore Ravens have taken a stand against domestic violence, announcing Monday on social media that they have cut ties with running back Ray Rice. The NFL then announced shortly afterward that Rice has been suspended indefinitely, signaling that the onetime star running back's days of playing in the NFL are essentially over. The news comes after video footage was leaked on gossip site TMZ that appears to show Rice punching his then-fiancee, Janay Palmer, in the face and knocking her unconscious. Rice then grabs Palmer and drags her body out of an Atlantic City, N.J., casino elevator before a security guard stops him. The incident took place earlier this year, and initially, leaked footage just showed Rice dragging Palmer, who is now his wife, from the elevator. Speculation was that a fight had ensued, but many in the Ravens organization argued that no one knew what had happened inside the elevator. The NFL handed down a two-game suspension to Rice, which many felt was too light, given what was rumored to have occurred inside the elevator. The emergence of the disturbing elevator footage, however, leaves little doubt as to what happened, and as such the Ravens, who stand to lose some $9.5 million, have cut the running back from the squad.